There’s no denying it – Instagram has fast become one of the best places for fashion inspiration, and the latest find to take the platform by storm is a very affordable Zara printed dress. The white Printed Dress, which features long sleeves and playful polka dots, has been spotted on several Instagram accounts recently, including popular bloggers Susie Verrill and Lily Pebbles. With a round neck, floating skirt and asymmetric ruffled hem, the dress is a light and playful addition to any spring wardrobe, and can be styled casually with chunky boots or trainers or with black heels and red lipstick for a glam after-hours look. There’s nothing worse than buying a new outfit, only for the look to be spoiled by a bloated stomach after a meal. However, Instagram users have been praising the dress for being both stylish and forgiving, with one shopper naming it the ‘carb loading dress’ thanks to its loose flowing design. Priced at £39.99, it’s unsurprising that the dress has been flying off shelves. Luckily, there are still some available in sizes M-XXL, although we don’t expect these to last long! 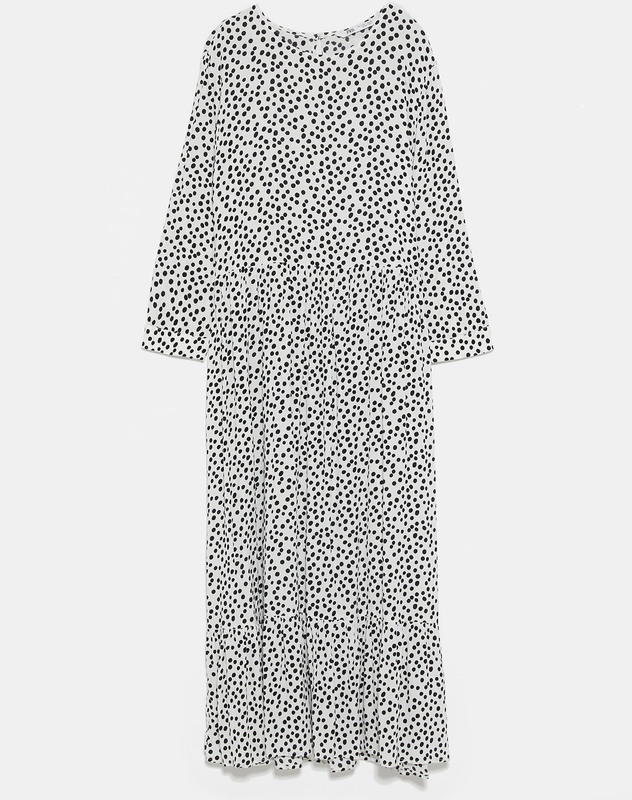 If you’re loving this season’s polka dot trend, Zara also have other gorgeous printed dresses on offer, including the Polka Dot Wrap Dress, which looks very similar to the Printed dress and also costs £39.99. For shoppers looking for a slightly different cut, Zara also sell a Long Polka Dot Dress with a collared neckline and belt to cinch you in at the waist, retailing at £39.99. But Zara isn’t the only high-street store with some winning dresses on offer at the moment. Marks and Spencer recently unveiled this week’s dress of the week, and it’s already proving very popular. So there’s no excuse to miss out on a stunning polka dot dress this spring!